After completing your purchase, we will give you instant access to our site builder toolkit and then you can upload your own product photographs, graphics, backgrounds, animations, and much more. Just log in, name your product groups, add your product photos and then paste in your PayPal payment buttons. Easy! 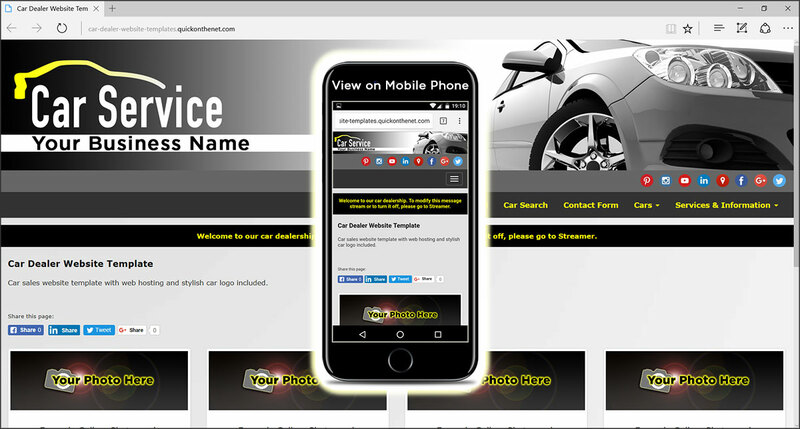 Designed by professional designers, your website already includes a stylish car logo, or if you prefer, you can add your own business logo. As standard, each website is supplied with 4 Product Groups, also known as 4 Product Galleries. Each gallery can contain many different products e.g. you could have 30 individual click-through products per gallery. As a guide, a standard website is good for around 100 Products. If you upgrade and buy Extra Galleries, then you will have a grand total of 20 Product Galleries. As a guide, a website with Extra Galleries is good for a whopping 1,000 Products. Each product is searchable, based on the keywords you add to each gallery item and we also supply a search bar as standard.